Situated on the easternmost point of Honshu, Iwate faces the Pacific Ocean to the east whilst bordering Akita towards the west, Aomori to the north and Miyagi to the south. Forming part of the Tohoku region, Iwate’s interior is home to a vast series of mountain ranges and several active volcanoes. According to local legend this prefecture got its name after locals summed the spirits to help stop a demon which had been harassing them by shackling it to the cliffs and imprinting its handprint as a seal of its oath on a large rock. Weather fact or myth, Iwate’s saw tooth coastline is as dramatic as its legend. 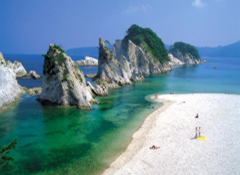 With over 200 miles of rocky shoreline Iwate is a land of unique contrasts with its high cliffs, countless bays and white sandy beaches. With such a vast expanse of coastline visitors should make their way to Jodogahama beach. Situated within a peaceful cove this beaches crystal clear waters are famous for invoking images of paradise. Heading inland toward the west, the city of Hanomaki boasts an impressive hot spring zone collectively known as Onsenkyo. Comprising of 11 different hot springs, this village is situated within the Towada-Hachimantia National Park and offers a uniquely rustic atmosphere. Further south, the small city of Hiraizumi was once the cultural capital of Japan, even surpassing the likes of Kyoto. Visitors can enjoy the spectacular Chuson-ji Temple considered to be one of Japan’s most important Buddhist Temples that features a hall decorated entirely of gold. For skiers and snowboarders, Appi -Kogen offers one of the best places within Tohoku to enjoy the winter. Famous for its powder snow and wide ski slopes, this resort offers a wealth of attractions whilst the nearby town has many comfortable lodging facilities. Whichever season you decide to visit, you will soon discover that Japan’s second largest prefecture is a place filled with endless discoveries. For more information about Iwate prefecture, see their official tourism website. 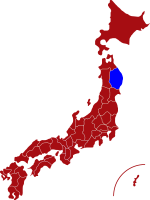 Air - Iwate is served by Hanamaki Airport which is about 20 miles south of the city centre and has flights to Sapporo, Osaka, Nagoya and Fukuoka. Click here for its English website. Rail - From Tokyo to Iwate's captial, Morioka, it takes just over two hours by the JR Tohoku Shinkansen or "bullet train" line. 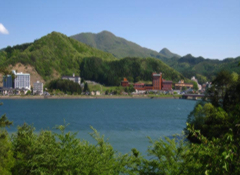 Tsunagi Hot Spring is a wonderful hot spring resort with a long history dating back more than 900 years. Mt. 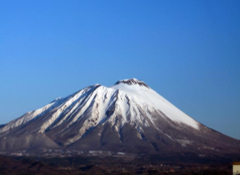 Iwate has the highest peak in Iwate Prefecture and is one of Japan's 100 Most Beautiful Mountains. Jodogahama Beach is ranked one of Japan's most beautiful beaches and is nationally designated as a Place of Scenic Beauty. 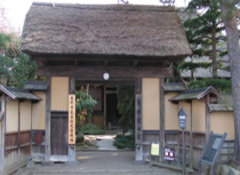 Samurai Residence Museum offers visitors the opportunity to experience what life was like during the Edo Period of Japanese history.